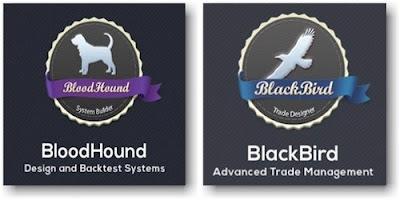 Order BloodHound and Blackbird and Start Trading!!! The JATS™ Complete Package* includes the JATSLRTLines™ Indicator for NT8 as well as a comprehensive set of Black Box Shark Indicators BloodHound Templates customized for NinjaTrader Charts and the Market Analyzer. Signals can be traded discretionary or automatically through NinjaTrader's ATM, or the Shark Indicators' Blackbird or Raven Strategies. 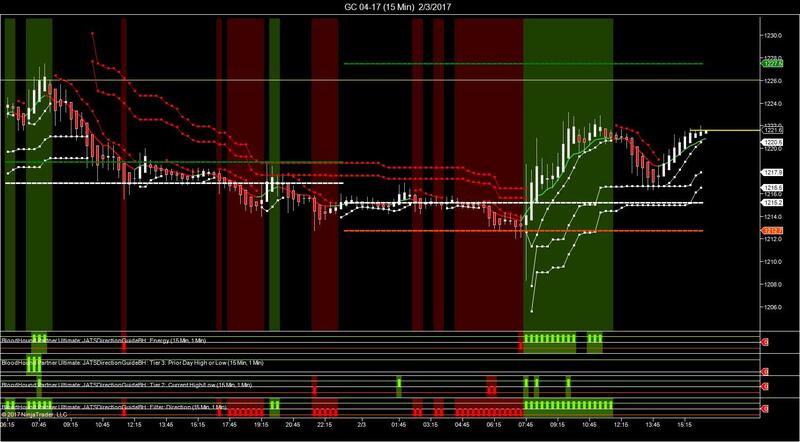 The bundle also includes other custom indicators, chart templates, trade plans and access to JATS' Trade Room. *Licenses for NinjaTrader, BloodHound Utlimate, Blackbird are Separate. 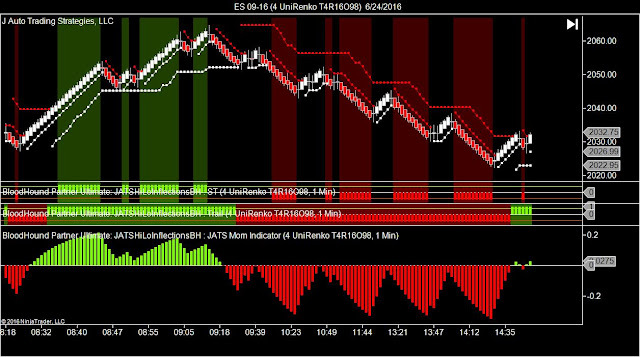 All JATS Indicator and Template Sales Final, AS IS WHEREIS, and subject to EULA and Terms and Conditions and Disclosures shown herein. *Licenses for NinjaTrader, BloodHound, Blackbird are Separate. All JATS Indicator and Template Sales Final, AS IS WHEREIS, and subject to EULA and Terms and Conditions and Disclosures shown herein. 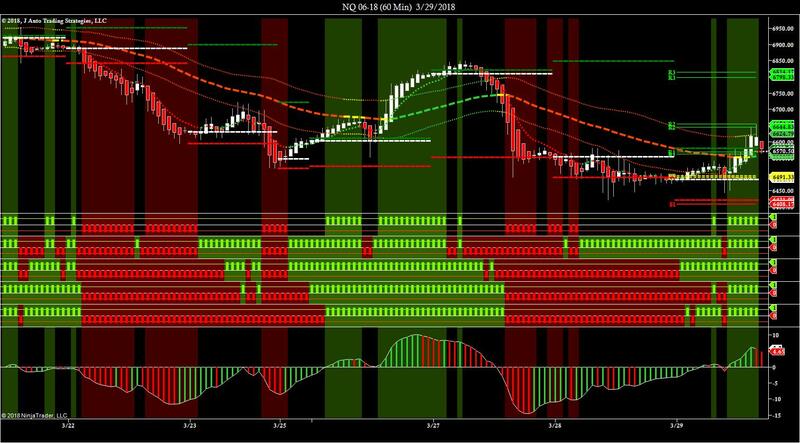 *License for NinjaTrader is Separate. 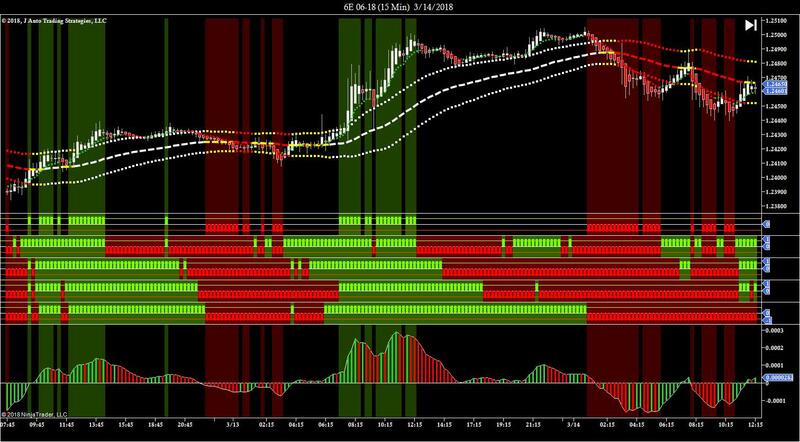 All JATS Indicator and Template Sales Final, AS IS WHEREIS, and subject to EULA and Terms and Conditions and Disclosures shown herein. All Shark Indicator Sales Final, AS IS WHEREIS, and subject to Shark Indicators Licensing. 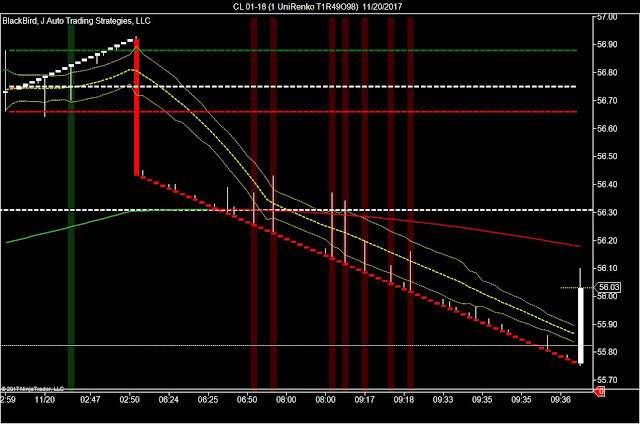 For purchases, complete the license registration shown below in NinjaTrader. Linear Regression trends respond more quickly to market conditions than moving averages can on minute charts. 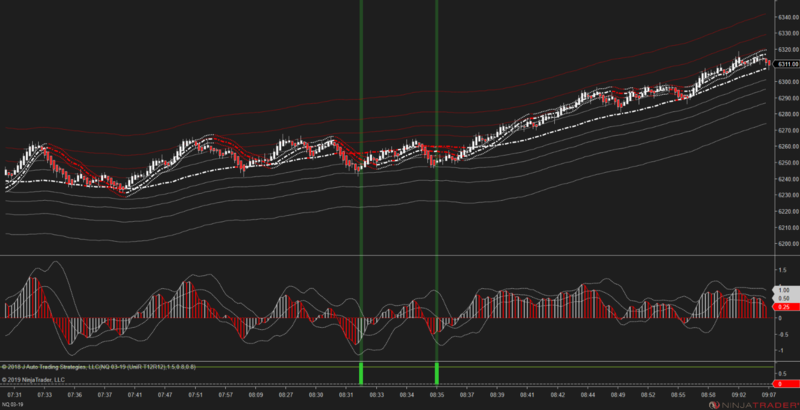 In the LRTBands BloodHound Template, you can select from multiple settings to find a trending condition across the 60 Minute, 30 Minute, 15 Minute, 5 Minute and 3 Minute Charts, or you can select the LRT-ALL solver to display when the settings all align together, as shown in the below screenshot. 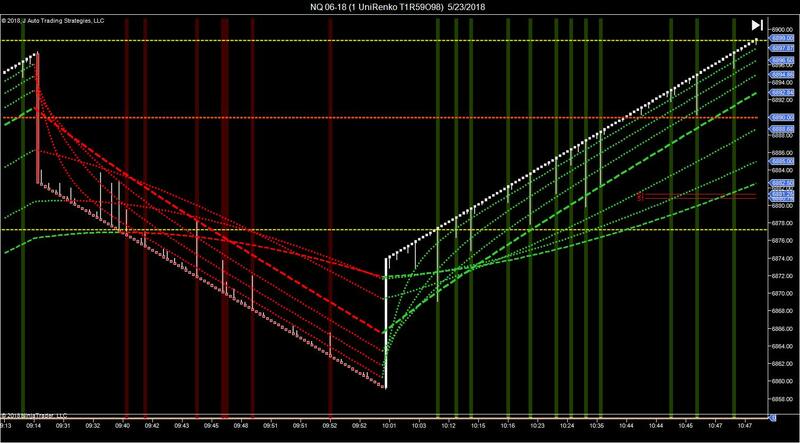 Josh Lukeman provides the foundation for a short-term day trading guide to help traders find the correct direction that price action is likely to trade during the regular cash trading sessions. 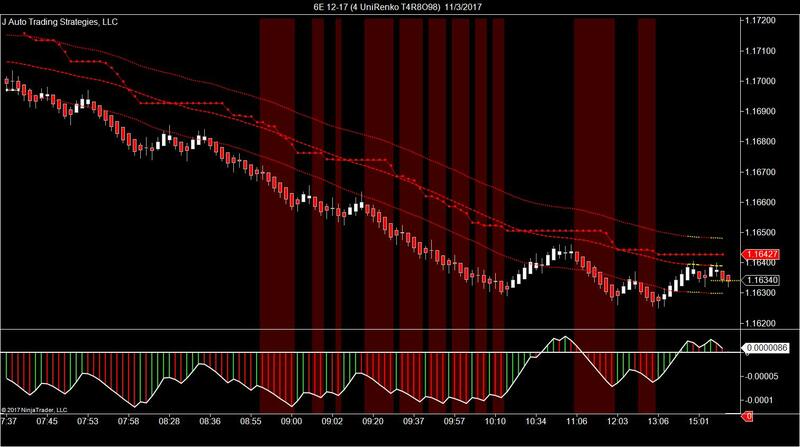 Lukeman emphasizes that a day trader has a better chance for a directional trade occurring when trades are taken in the direction of the short-term trend. 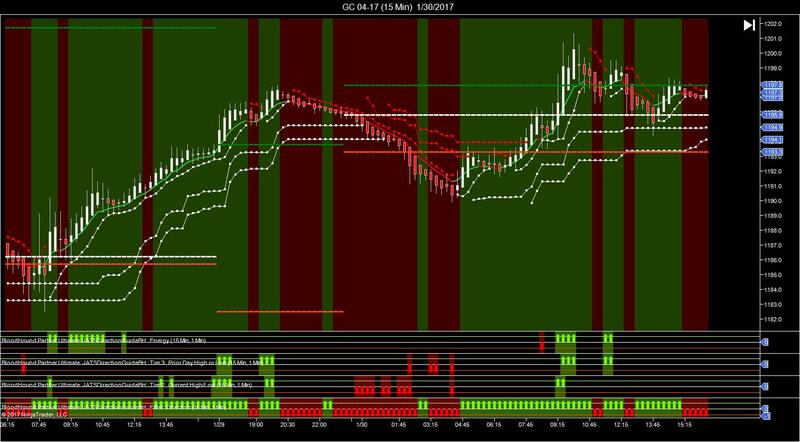 He then refers to this opening price signal as a simple and effective gauge for determining the daily trend of a stock or market. The opening price signal is the last price minus the opening price. If the net difference between the last price and the opening price is positive by 1/4 point or more, it is a positive opening price signal. Lukeman advises to trade only in the direction of the opening price signal. The JATS Direction Guide for Day Trading BloodHound template takes these core concepts of Trend, the Net Price Rule and the Open Price Rule, and combines them with customized filters and a four tier trading system to help identify the optimum trend opportunities for our market within the larger directional trend framework. The Market Analyzer BloodHound Templates provide higher time frame tend signals for the for the Weekly, Daily, 60 Minute and 15 Minute charts. 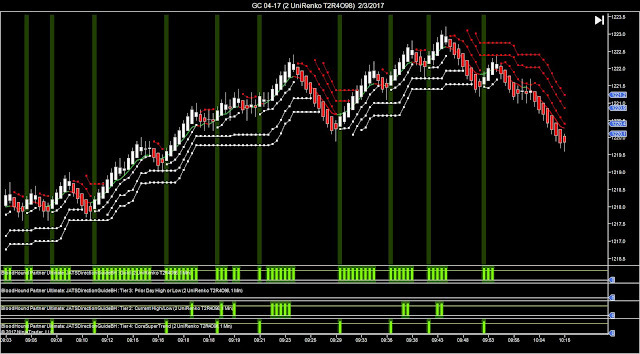 Also, BloodHound Templates for a fast Higher Time Frame Trend, a 15 Minute Range Breakout, Prior Close and Super Trend Indicator. The JATS Direction Guide core template solvers are meant to be used as a background "directional guide" day trading indicator and are based off the net price/open price signals and short term trend for the above markets included. 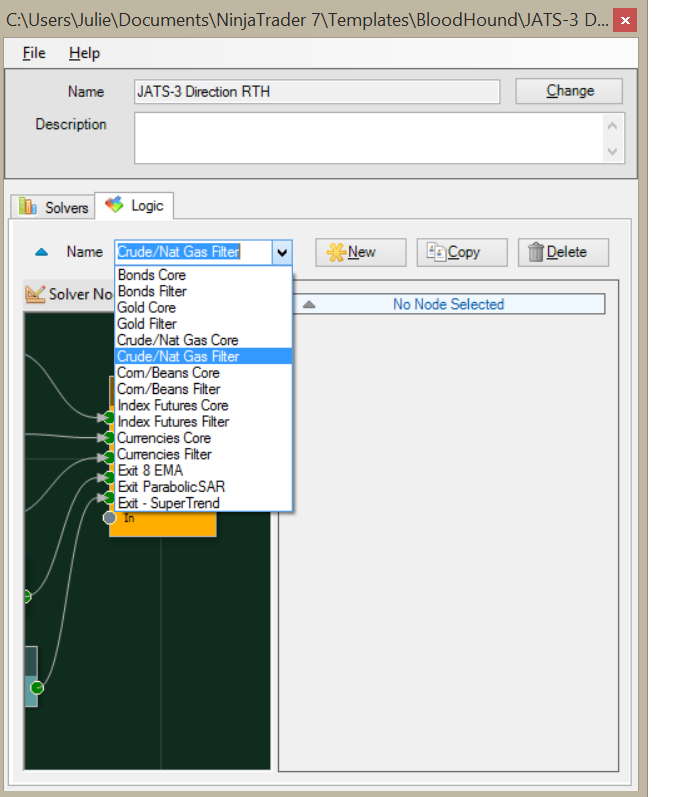 Data is preselected to the RTH Session Template for each market. 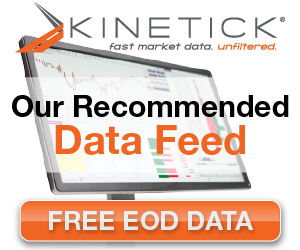 Once you find the market’s short-term trend direction in the Market Analyzer, you can consider using the core solver or one of the other filtered solvers for timing entries. JATS HILO Inflections is a BloodHound template is a must have to trade volatility. 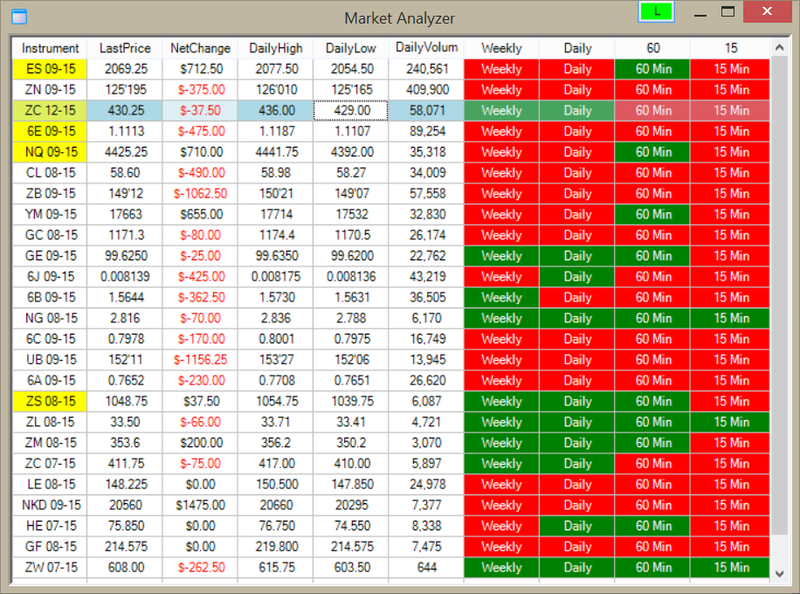 It is recommended for use during trending market conditions and with the JATS Direction Guide Template and Trade Plan. 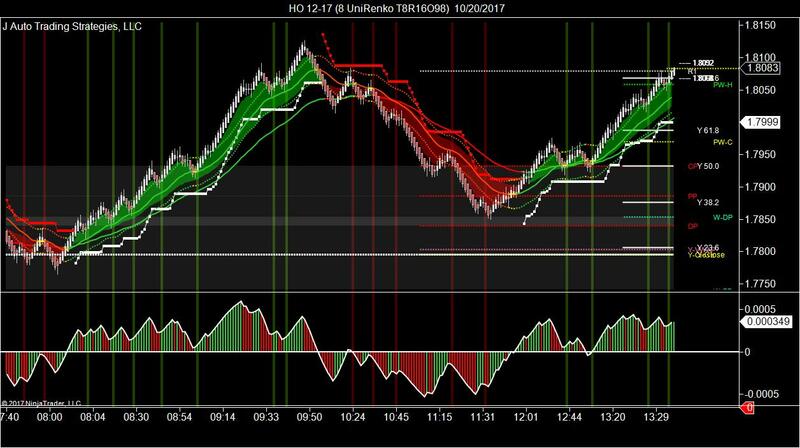 There are two third party indicators included in the strategy, the Super Trend Indicator and the Gann HiLo Activator, and the customized UniRenko bar is also included. 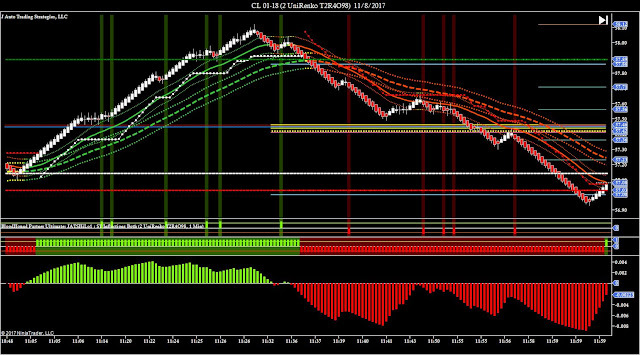 Have you ever wondered why your trade is not working out? All the stars seem to be aligned. The Weekly, Daily, 60 and 15 minute charts are all trending higher together, yet the trades are struggling to get anywhere and you are getting stopped out. Well, the volatility for your time period could be on the wrong side of the market. The JATSHiLoInflectionsBH Template is the perfect compliment to the Direction Guide template and will help you nail the trades at the right time. 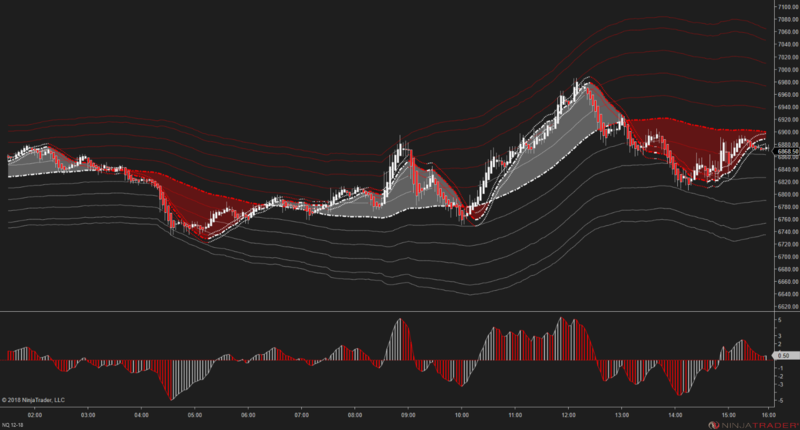 The JATS MACT BloodHound template transfers the components from JATS custom Market Analyzer to your charts. You can now control market analyzer settings for the Higher Time Frame Trend, Prior Close, SuperTrend and Range and use these settings in your strategy. The JATS Bollinger/Keltner Bands BloodHound & chart templates were designed to assist traders in identifying possible trend continuations that occur at a custom standard deviation level, especially when the signal follows a "with trend" momentum divergence inflection. The BH template has several solvers including, Direction, Bollinger Trend, Bollinger Expansion, Bollinger Squeeze, Reversals using Bollinger/Momentum divergence, and Trail. We at J Auto Trading Strategies, LLC are not certified traders nor are we certified financial planners. We all chose this profession so that we could take our destiny into our own hands and aspire to a future of independence and satisfaction. We offer NO warranty whatsoever. 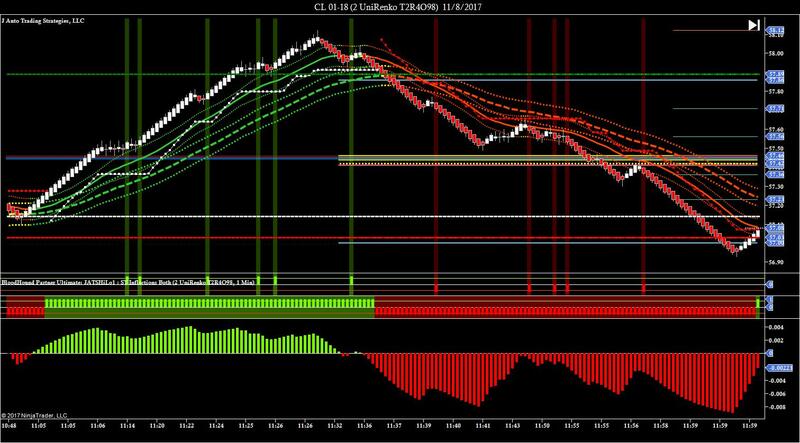 Execution techniques differ from trader to trader. 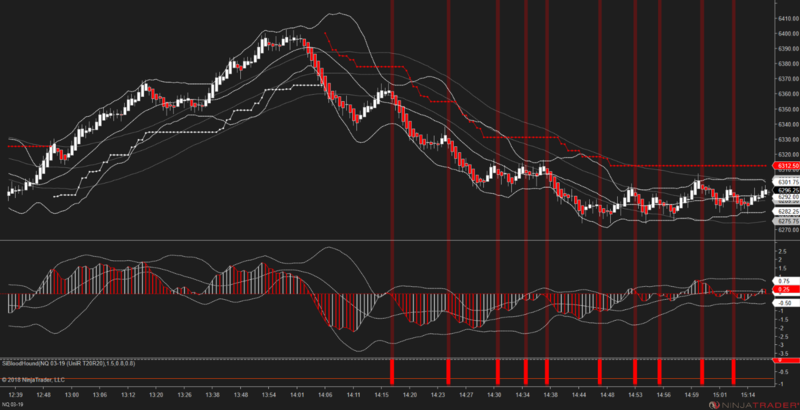 There is no way for us to predict any outcome of your trading. Futures and forex trading have large potential rewards, but also contain substantial risk and is not for every investor. An investor could potentially lose all or more than the initial investment. Risk capital is money that can be lost without jeopardizing ones' financial security or life style. Don’t trade with money you can’t afford to lose. Only risk capital should be used for trading and only those with sufficient risk capital should consider trading. J Auto Trading Strategies, LLC ("JATS") does not hold itself out as a Commodity Trading Advisor ("CTA"). Given this representation, all information and material provided by JATS is for educational purposes only and should not be considered specific investment advice. 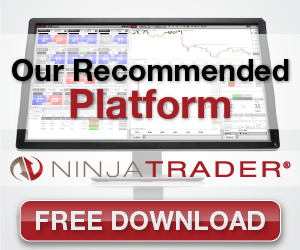 All trades, patterns, charts, systems, etc., discussed in this website and the product materials are for illustrative purposes only and not to be constructed as specific advisory recommendations. By accessing this site's products, services, and information, you accept the foregoing limitations of liability and do not hold Julie Wade or J Auto Trading Strategies,LLC, its officers/employees, assigns, and affiliates accountable for any and all liability. You agree that all products and services provided herein are on an "as is" basis. Julie Wade and J Auto Trading Strategies, LLC expressly disclaim any and all warranties, whether express, oral, implied, statutory or otherwise, of any kind to the users and/or any third party, including any implied warranties of accuracy, timeliness, completeness, merchantability and fitness for a particular purpose. Copyright © 2019, J Auto Trading Strategies, LLC. All Rights Reserved. No part of this website may be reproduced, stored in a retrieval system or transmitted in any form or by any means, electronic, mechanical, photocopying, recording, scanning or otherwise, except under the terms of the Copyright Designs and Patents Act 1988 or without express written permission of the author.